For an article on the presentation of 'Livings' from about 1700 to the mid 1800's, click here, and look for the item headed 'Searching Old records', and the section beginning: "Mr Caley’s Observations respecting the Living of Arborfield". 1839 Sir John Warren Hayes, Bart., M.A. Claude Sparshott became Rector in 1946. The 'Reading Mercury' of 5th October reported that he "was installed and inducted on Wednesday last week. In the evening, he was ‘At Home’ to about 100 parishioners at the Village Hall. Mr Sparshott was ordained in Newfoundland in 1930 and spent 6 years among the Labrador settlements, his ‘parish’ embracing 300 miles of coastline, which had to be traversed by water in summer and dog sleigh in the winter. From 1944 to 1946 he served as a naval chaplain." Geoffrey Carr was born in 1909, married Elizabeth (Betty) in 1931 and had two sons, Peter and David, and a daughter, Merylin. He was born in the village of Walderton, West Sussex, and went to Monkton Combe School, near Bath. After studying at Christ College, Cambridge, he taught at St. Faith's School, Cambridge. Geoffrey trained for the Ministry at Ridley Hall, and served as a Curate at St. Luke's Hampstead, then for 6 months at Holy Trinity, Corfu. After a spell as Curate at Christ Church, Southport, he became Vicar of St. Thomas, Stafford, then Vicar, All Saints, Wellington and Eyton, Shropshire. After some time as Rector at St. Andrews, Bradfield, Berks, he became Rector, St. Bartholomew's, Arborfield, and can be seen in the photo of the Centenary Celebrations of the 'new' St. Bartholomew's building in 1963. He retired to Guildford, Surrey, and died in 1999 aged 89. In 1976, he recorded his memories of parish life. 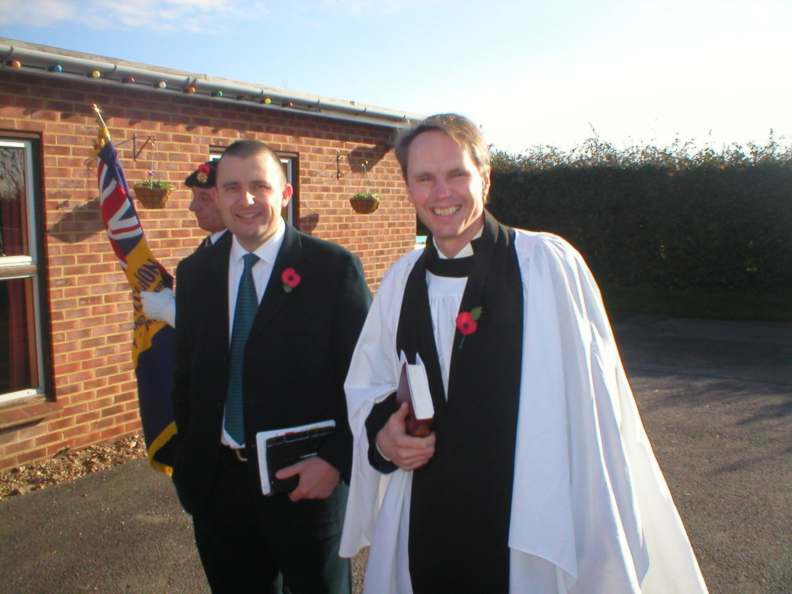 Ian Bull spent some time as a chaplain at Arborfield Garrison, and became the first Rector of the combined benefice of Arborfield and Barkham, starting in 1977, moving into Arborfield Rectory with his wife Joan and their daughter Georgina; their sons had already grown up. The congregation at Barkham had dwindled to single figures by the mid-1970's, but in a few months, it had grown strongly, and now the church is regularly full. Ian moved to be the Vicar of Bangkok, but sadly developed a brain tumour and returned to the U.K. for diagnosis and treatment. He died aged only 50, and is buried at Barkham. Bob Bawtree and his wife Lois spent a decade at Arborfield with their growing family, encouraging many people to explore their calling and to work with organisations such as Youth With a Mission ('YWAM'). By this time, the congregations could count on many 'home-grown' Readers and others capable of preaching powerful sermons. Bob eventually moved on to become Vicar of Hildenborough in Kent, where he was also Rural Dean of Tonbridge and Honorary Canon of Rochester Cathedral. He is now retired but served for some time as an Assistant Priest in Yeovil. His son Andy is serving as a minister in the Episcopalian Church in the U.S.
David Rowe and his American wife Pixie moved to Arborfield from Basingstoke, bringing with them a passion for evangelism and introducing many new skills to the congregation, such as story-boarding and acting sketches. David encouraged acting in the local Junior School, and many will remember the 'Train' sketch 'London to York', which is an update of the Good Samaritan, and 'David and Goliath', which was once hilariously enacted at the Holiday Bible Club with son Caleb in the role of David. He used the 'Story-board' technique to good advantage at the Parish Council Centenary Celebrations in 1994. Pixie is herself trained as a Reader. David was Rector of Wilford Church in Nottingham for some years - see their web-site here. Before Basingstoke, he was a curate at Moor Lane, Cranham, Essex. David became Warden of Lee Abbey in Devon in October 2008. Piers Bickersteth is the son of a Bishop, but worked in commerce for some time before he felt called to train for the ministry. His strength is in teaching, and before 1998 he worked full-time for the Proclamation Trust where he trained Jon Ikin, who was Pastor of the Arborfield Mission for several years. By coincidence, Piers also moved to Arborfield, with his wife Caroline and their family. Arborfield and Barkham Churches operate a Trust, which has seen several 'Apprentices' pass through, including Ken MacDonald and John Parker. Ken is now on the preaching team, while John Parker finished his training for the Ministry at Oak Hill Theological College in Southgate, North London, and returned to join the leadership team as a Curate.